Announcing something NEW & EXCITING! 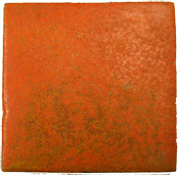 For quite some time the Tile Heritage Foundation has ‘desired to aspire’ to selling lovely collectible contemporary art tiles from member artists as a permanent feature of the THF website. VISIT! This special ‘Tile Store’ page is now a reality and showcased. ART TILES are a wonderful gift to give all year long! 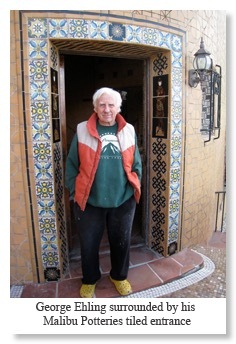 Tiles are offered by individual THF member artisans in support of the Tile Heritage Foundation. Selling a specific tile at this site where a percentage of sales support THF is open to all current THF members who make tiles. Email: foundation@tileheritage.org for details on how to participate. We are looking forward to offering a large array of beautiful tiles! Brechelle Ware hails from Twisp, Washington, commuting to Healdsburg every six weeks or so for a 10-day stint at Tile Heritage. Formally Bre is the Collections Manager - informally the “Queen of Done” as she is forever completing tasks of an infinite variety. 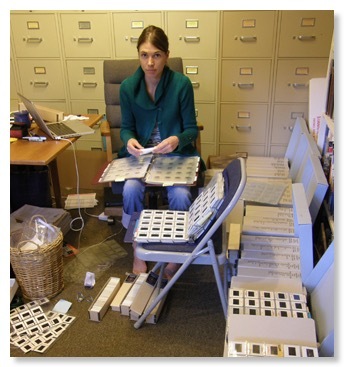 For the past three years, perhaps more, her primary focus has been overseeing the digitizing of the Foundation’s slide library. This task is now complete, although the metadata must still be added to each image. Currently, there are 35,455 images in the Aperture database, over 20,000 of which are from slides: 12,300 of contemporary artists and artisans and historic tiles; nearly 5000 of installations in the U.S. and nearly 3000 of foreign installations. 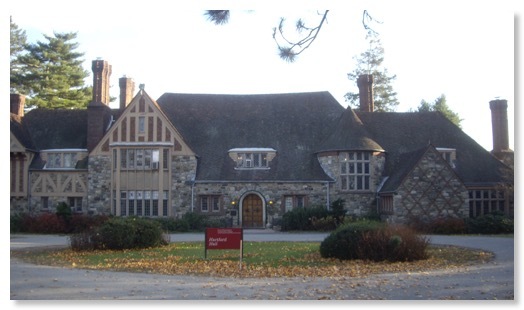 Support the ARCHIVES with a donation? Click here! 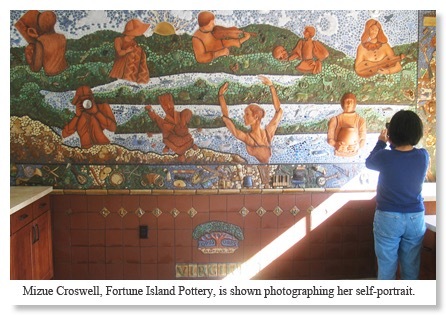 Dale Wiley first got mixed up with Tile Heritage in the late 1980s when, as a naive and fledgling tile maker, she was invited to serve on the board. She held this position for twelve years, and somewhere in there (no one really remembers when anymore) she began working very part time as the Membership Renewals Secretary--a position she holds to this day because of her enchantment with tile and her abiding love and respect for the organization and its founders. Dale no longer messes about with clay; when she has time, she dabbles in paint and pastels, imitating her favorite subject: nature. However, most of her time these days is consumed by teaching art to challenging but lovable teenagers at a continuation high school. Time to renew your membership? Click here! 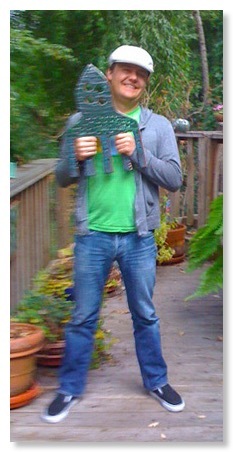 Alistair Hamilton - seen here with the ‘Rocket Tile’ (made by Josh Blanc, Clay Squared to Infinity) awarded to him by Tile Heritage for his high-octane, ceaseless energy and involvement with the development and maintenance of all of the Foundation’s technological needs. Drawing from his skills and experience he keeps things purring along like a well oiled machine from the redesign of the current website to constantly ensuring that software and equipment is updated and fully functioning. Thank you Alistair, the Tile Heritage Most Valuable Volunteer, for providing a generous and ongoing ‘gift-in-kind’ for the organization. 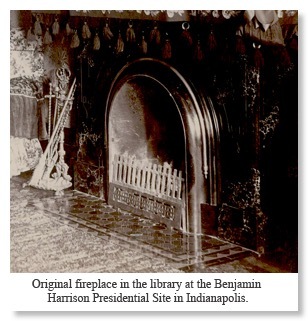 I am doing some research on tiles in front of a fireplace at the Benjamin Harrison Home. The photos, in black and white or sepia in color, are from 1888 and one slightly earlier. 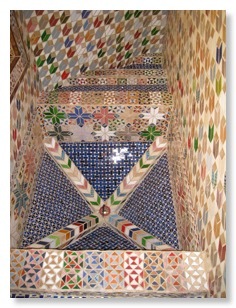 Would you by chance have a suggestion of color by looking at the tile pattern? 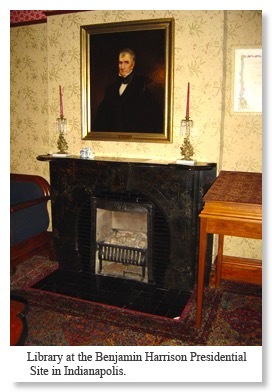 We do have original wallpaper from this room and the original marble mantel. I have attached a couple of photos showing the original tiles and a modern photo showing what the mantel and room look like today. We are hoping to put back tiles to more closely resemble the 1880s photos. (your guess would be as good as ours as to the original colors). Also read "Glazed Tiles." We think, judging from the pictures you sent, that your hearth tiles were glazed with a clear glaze as described, hence the resulting glossy surfaces, commonly preferred in late 19th century homes. See linked pdf. We have found that opening the pdf in Preview or Photoshop, and then enlarging each page, provides the clearest image. Glad we could help. Let us know if you need recommendations of tile makers. 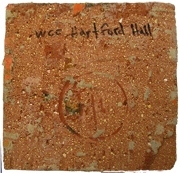 We’re looking for help in identification of these original tiles from Hartford House, a former mansion in Valhalla, NY designed by Mann & MacNeille in 1927; the building was completed before 1932. We haven’t seen the tiles themselves, but have the attached pictures; size appears to be 6x6. Any assistance would be greatly appreciated. Thank you. 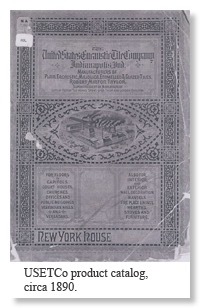 Yours is a "faience" tile produced by the American Encaustic Tiling Company, most likely in its factory in Zanesville, Ohio. A "faience" tile is one manufactured in the U.S. to look like a handmade tile, which it is not. These tiles became especially popular during the 1920s in reaction to the handmade tiles of the Arts and Crafts movement in this country. It's a beauty and Hartford Hall is gorgeous! George Ehling's master work is embodied in his home in the Hollywood Hills, which he bought in 1967. The house was built in 1927, the same year Ehling was born. 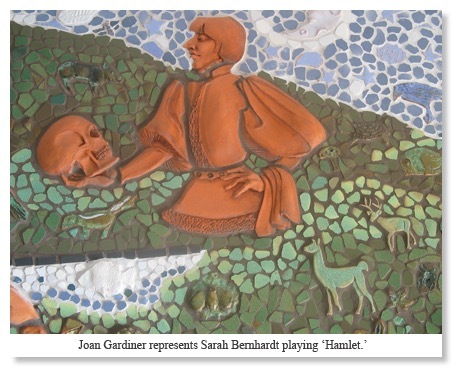 George Ehling, a former professional wrestler, actor and carpenter for the movie studios has been creating mosaics by hand throughout the house for 40 years. 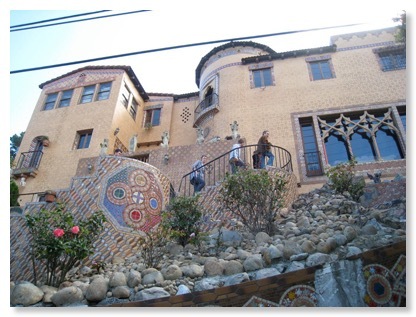 Like Watts Towers’ Simon Rodia, Ehling also uses found materials such as wine and beer bottle bottoms and tiles people have thrown out. He then cuts the discarded materials down to size to create the tesserae he needs for his intricate tile work. Winged Dog Tile, as they say, is a small tile company with a funny name, but they’re serious about producing well-crafted, handmade tile. Blending the skills and talents of two artists from two different disciplines, the couple began making tiles in Sacramento in 1992 and will soon be celebrating 20 years of outrageous electric bills. David Vargo is a professional sculptor/ceramist. His personal work incorporates dogs interacting in human environments—his work can be found in several major collections and museums. He also teaches ceramics and sculpture. 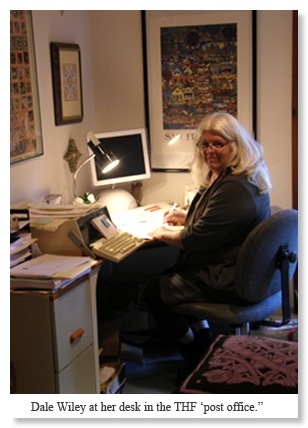 In a prior life Sandra Cosner was an art director who designed print collateral for a variety ofclients and nonprofit organizations. 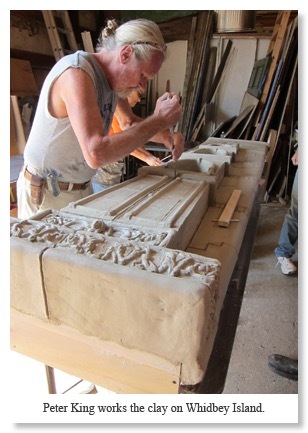 Inspired by the array of fireplace mantels in the Tile Heritage Foundation’s Summer E-News, the couple emailed with a mantel of their own making: a complete re-creation of a California Art Tile Company mantel from the 1920s. The original fireplace, which was located in Petaluma, California had been ruined by an earthquake and subsequent water damage. The homeowner’s insurance generously covered the cost of remaking these vintage tiles! 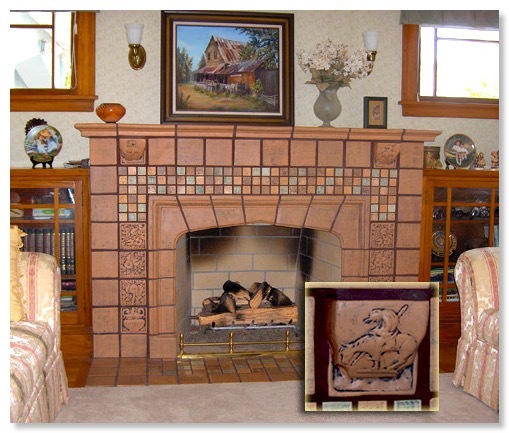 And Winged Dog Tile has the molds if anyone is interested in a replica of this Cal Art fireplace. Visit the website. The century-old tiled fireplace stood out like a broken tooth. Its central design was supposed to be a three-tile panel of a reclining Roman soldier, but the first tile -- the soldier's head and chest -- was missing. The team restoring this California home asked: Could Linda Ellett, founder of L'esperance Tile Works outside of Saratoga Springs, re-create the missing tile? Read the whole story . . . and scroll down at that link! Paul Lewing and Marci Blattenberger are going to be presenting a lecture on china paint at the 2012 NCECA (National Conference on Education in the Ceramic Arts) in Seattle. The lecture will focus on the history of china paint and on what contemporary china painters and clay artists are doing today. 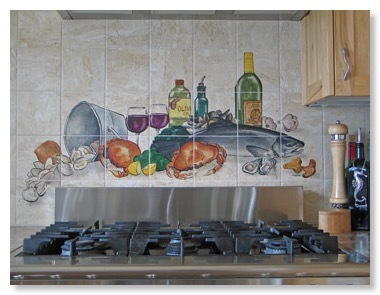 If you use china paint on your tile, they would love to include some images of your work. Send by email to pjlewing@comcast.net or mail on CD to Paul Lewing, 105 N 200th St., Shoreline, WA 98133. This will be a PowerPoint presentation, so images do not need to be as high resolution as for printing, but it's fine if they are. volunteers from the local art community. 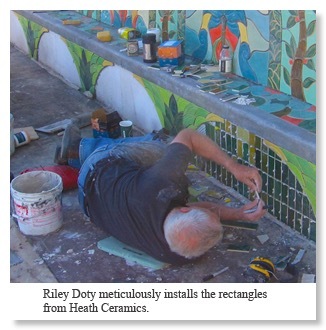 The mural was dedicated on October 9, 2011. The Barns of Rose Hill announced the receipt of grants from the Richard and Caroline T. Gwathmey Memorial Trust and the Marion Park Lewis Foundation. The Gwathmey Trust awarded a grant of $12,000 toward the creation of the “Shenandoah Life” mural project; the Marion Park Lewis Foundation granted $3,000, $1,800 of which was designated for the mosaic. The mission of The Barns is to create a space to celebrate life, the arts, and our culture; to educate in ways meaningful to our people; and to offer enhancement of the quality of life to our community and to visitors to our small town. California Street in San Francisco rises as it approaches its western terminus at Lincoln Park, meeting a set of concrete steps dating to the early 1900s that lead up to Lincoln Park in the Richmond District of the city. 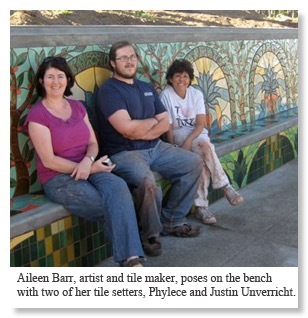 Thanks to the Friends of Lincoln Park, there is now a beautiful new tiled bench that greets you as you ascend. 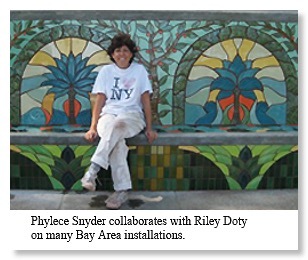 The bench is the most recent creation of mosaic artist and tile maker, Aileen Barr, already recognized in San Francisco for the award-winning 16th Avenue Tiled Steps at Golden Gate Heights (see www.tiledsteps.org), which she created with Colette Crutcher. The imagery for the Lincoln Park bench was derived from historic photographs from the 1890s, including the Sutro Baths and the Midwinter International Exposition in 1894, filtered through Barr’s creative vision. 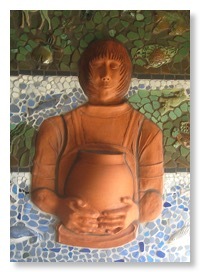 The tiles themselves were produced in Barr’s ceramic studio in San Francisco, supplemented by the rectangular tiles supplied by Heath Ceramics in Sausalito. Installation of the tiles was a challenge, expertly handled by Riley Doty and Phylece Snyder, an incomparable “tag-team” of talent, with assistance from Justin Unverricht. The bench represents the first of three phases of this neighborhood restoration. Pillars on either side of the steps will be tiled next followed by the tiling of the stair risers. An inspired look at the overall project including a schematic drawing of the proposed pillars and risers can be seen by clicking here. And for a closer look at the spirited artist, see Aileen Barr. The talented team of Peter King and Xinia Marin from Stonehaus in Pensacola, Florida engaged a group of clay enthusiasts for a 5-day architectural ceramics workshop on Whidbey Island, directly following a Potters Council conference in Seattle in late June 2011 where the esteemed couple had been presenters. 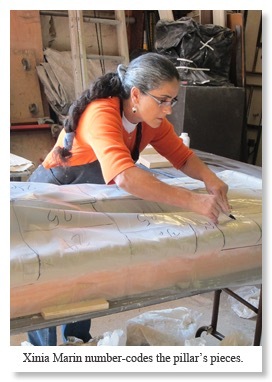 The workshop was hosted by Carol Rose Dean, Dean Tile and Design, on Whidbey Island. 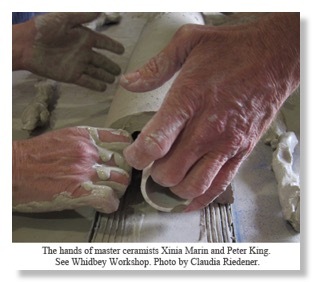 Peter and Xinia are extremely dynamic instructors, and a 5-day workshop is barely long enough to get a handle on the myriad clay techniques they use to make their pieces. Each morning they begin by showing slides of their enormous body of work, amazing photos that demonstrate the process involved in large scale projects from the beginning to the end—from the proposed space to the studio where the forms are built and the clay is shaped and then to the final installation. Also included are slides of places the couple has traveled, including the buildings and spaces they have found to be inspirational along the way. Day after day the group was energized, ready to get their hands in clay! After the initial slide show, the class went out to the front of the building to evaluate the space for the proposed piece they would be making together. The decision was made to do pillars on either side of the entrance, with a connecting arch overhead. The next step was to build a wooden form the size of the piece, adding 10% for shrinkage. When that was finished, the clay work began. The twelve participants then rolled out two 2-foot by 10-foot slabs to serve as the pillars. Decoration ensued. 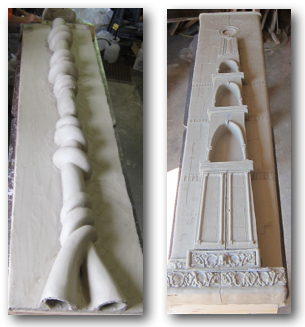 Then the pillars were cut into pieces, allowed to dry, and then bisque-fired. At present the pillars are taking up space on the studio floor waiting to be glazed and fired… Hopefully the finished piece will be installed and photographed in the springs of 2012. Special thanks to Carol Rose Dean, Dean Tile & Design and to Claudia Riedener, Ixia Tile Tacoma for providing the pictures. E-News is available regularly to Tile Heritage members and friends. If your email address has changed, please e-mail from the address you would like us to use. Not a current THF member? Join us!